Dealing with a traditional garden hose can be a pain. The bulkiness, the awkward dragging, the annoying kinks, and the constant leaks making yard work a nightmarish chore. 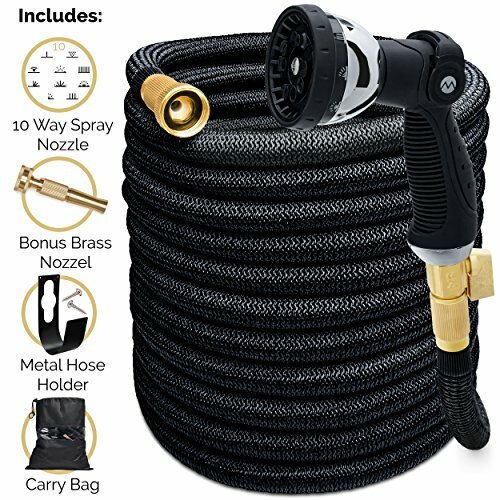 All this hassle doesn’t exist with Morvat’s shrinkable Garden Hose! Innovatively designed, it expands up to 3 times its size when water is turned on and shrinks back when you turn the water off. And it’s surprisingly lightweight too! Morvat is all about giving you products designed with premium quality and craftsmanship. Our Garden Hose set is just another testament to this. The retractable hose is made using a 3-layer natural latex core covered with 500D nylon weaving. The connectors are made using rust-proof and crack-resistant solid Brass. The Sprayer Nozzle-head is designed to withstand hundreds of uses. The high-quality Rubber Washers effectively keeps it from leaking. If quality is at the top of your checklist, then you’ve come to the right place! - Non-slip Spray Nozzle features 10 adjustable spray patterns. - Built-in Shut Off valve on connector ensures maximum convenience. - Heavy-Duty Hose easily withstands pressure up to 9 bar. - Comes with a Hose Holder and Storage Bag for space-friendly storage. ULTRA HEAVY-DUTY DESIGN: Enjoy quality that will last you for years with our Premium Expandable Hose with All-Brass Connectors. The flexible Garden Hose is made using a 3-layer latex 500D cover. NO MORE BULKINESS: This is the most lightweight Expandable Garden Hose of its kind. It expands up to 3X its original length when water is turned on and automatically shrinks back to a compact Garden Hose when water is turned off. No more dragging a rubber Garden Hose. SPRAYING MADE SIMPLE: Our Brand New ergonomically-shaped Spray Nozzle head allows you to choose between 10 different spray patterns. Hose down the sidewalk, wash the pup, water those plants, or give wash the car until it's squeaky clean without any hassle. ON/OFF VALVE: One of the Brass Connectors even comes with an in-built shutoff valve to conveniently save you trips to the spigot. We've also included high quality Rubber Washers with the the rust and corrosion-free Brass Connectors to effectively keep it from leaking. EASY TO STORE: The collapsible and expanding garden hose makes for space-friendly storage by retracting to a fraction of its size. Includes: Storage Bag and Hose Hanger as well! We also guarantee your satisfaction! If you don't love it or if you have any issues, just contact us and we'll do whatever we can to make you happy!